1. Rinse scallops in cold water, drain well in a colander and pat dry with paper towels. Cut each scallop lengthwise in half to make coins. Mix together in a medium bowl, 2 Tbsp (30 mL) cornstarch, 1 tsp (5 mL) soy sauce, 1 tsp (5 mL) cooking wine or dry sherry, 1 tsp (5 mL) sesame oil and 1 tsp (5 mL) sugar. Add scallops and gently mix to combine; set aside. 2. In a small bowl, mix together the remaining cornstarch, soy sauce, rice cooking wine, sesame oil, sugar and the chicken broth, oyster sauce and salt. Set aside. 3. Add 1 Tbsp (15 mL) of the canola oil into the scallop mixture and mix well. Heat a 14-inch flat bottomed wok or skillet over high heat until hot but not smoking. Swirl 1 Tbsp (15 mL) of the canola oil over the wok and add the scallops, spreading them onto the wok. Cook undisturbed 1 to 2 minutes until they start to brown, then stirfry using a metal spatula for a further 1 to 2 minutes until the scallops are firm an slightly brown. Remove and set aside on a warm plate. 4. Wash the wok and dry completely. Heat the wok over high heat and add the remaining canola oil. When hot, add the ginger and garlic and stir fry for 10 seconds. Add the bell peppers, snow peas and green onions and stirfry 2 to 3 minutes or until the peppers start to soften. Mix the sauce mixture again and swirl into the wok. 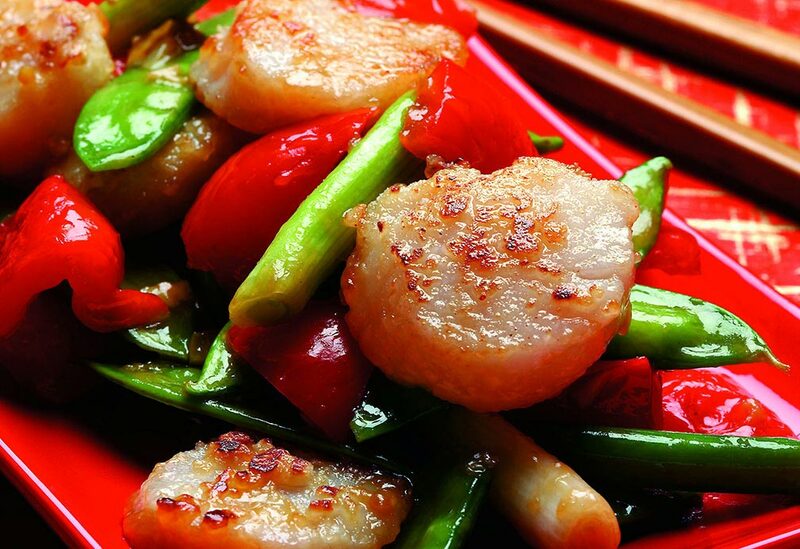 Add the scallops and any collected juices and stirfry for another 1 to 2 minutes or until the sauce has thickened and the scallops are just cooked through. Transfer to a warm serving platter.